An unprecedented number of wildfires in Canada caused unhealthy levels of air pollution in many areas of the US in late June and early July of this year. According to NBC News, as the smoke from these fires drifted across North America, air quality alerts were issued across the US covering the entire state of Minnesota; large parts of North Dakota, South Dakota, eastern Nebraska, Iowa, Illinois and Missouri; northeastern Colorado; and much of western and central Washington. 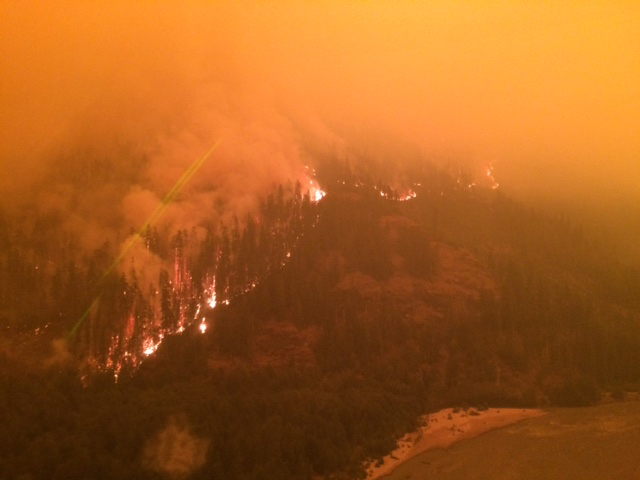 These fires also set the internet ablaze with blogs, news and Tweets. This is an understandable reaction given that the US does not commonly experience these levels of poor air quality. A blog went as far as saying that the air quality in Minnesota was worse than in Beijing. While this was true temporarily (due to the influence of the Canadian wildfires), in general, the air quality in the US is much better than in Beijing and other polluted cities of the world. It is hard to imagine how people in these cities are able to cope with these dangerous levels of air pollution on a regular basis. Having grown up in Mexico City I can relate to those experiencing elevated levels of air pollution and poor visibility on a regular basis. 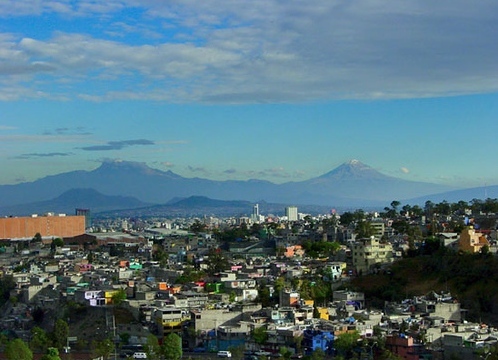 The picture to the right shows an exceptional event in Mexico City, where an exceptional event was not a day with poor air quality but, to the contrary, a clear day when you could see the Popo and the Izta volcanoes that surround and watch over the city. The love story of these two scenic volcanoes can be read here. However, as it comes to dispersion modeling, the exceptional events from the Canadian wildfires are anything but a love story. That is the case because the high monitored observations resulting from these fires will most likely impact the design value of NOx, CO, PM2.5 and PM10 concentrations for the period of 2013-2015. This is true because it is difficult to segregate the contribution from exceptional events from the rest of the sources in ambient air. Only in cases of exceedances of the NAAQS will States be prompted to flag these data and request their exclusion from the design value calculations. Therefore, the monitors affected by these wildfires will exhibit higher concentrations that will bias the monitored distribution and result in higher design values. Data from these ambient monitors are used in cumulative dispersion modeling evaluations to account for background levels of air pollution. EPA’s recent guidance recommends the use of the maximum or design value concentrations from the monitor to combine with the concentrations from AERMOD. As an example, PM2.5 is one of the most challenging pollutants to model due, in part, to the high background concentrations that can be 25 μg/m3 or more. Since the 24-hour PM2.5 standard is 35 μg/m3, in a cumulative analysis this leaves only 10 μg/m3 to account for the source being modeled and its neighbors. However, as I have described in numerous talks and presentations, combining the design value from the monitor with the design value from AERMOD results in a combined probability that is extremely unlikely to happen. This is akin to rolling the dice and waiting for a “six”, it is hard enough to get a “six” on a roll of the dice (one chance out of six), but, it is even more difficult to get “sixes” when rolling two dice at the same time (one chance out of 36 = 1/6 * 1/6). Likewise, assuming that the 98th worse modeled concentration happens at the same time as the 98th worse monitored concentration is significantly less likely. Phenomena in nature approximates the normal distribution. If we use the height of people as an example, we will find that a few people are very short, many people are average height, and a few people are very tall. If such a sampling is done at random the distribution of heights will look similar to the normal distribution shown below. However, when a normal distribution is influenced by very high observations, the distribution is “stretched” to the right. This is called a positively skewed distribution. Even a few very high observations will cause the distribution to get “stretched” to the right. This means that the 98th (or 99th) percentile will significantly increase as high observations are included in the distribution. While the inclusion of these high observations may be fine for determining NAAQS compliance, these extreme values are not suitable for use as background in cumulative modeling evaluations. That is why I have proposed the use of the 50th percentile to account for background concentrations in cumulative modeling evaluations instead of the design value (i.e., 98th or 99th percentile). Why did I choose the 50th percentile? Well, the 50th percentile is the median. 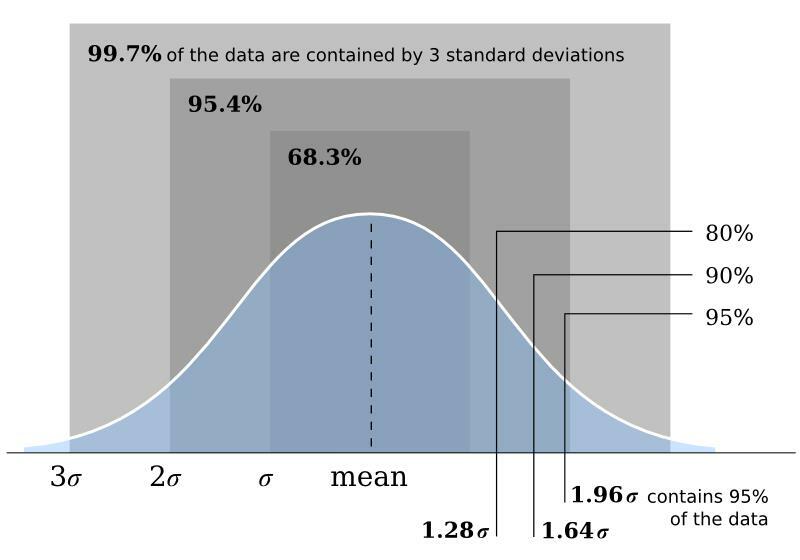 The median is the value where half of the observations are above and half of them are below that value. The median is less influenced by exceptional events. This is one of the reasons why home values are commonly reported as median values and not average values. This is a better measure than the average (mean) which is heavily influenced by one or few home prices that are significantly more expensive than the rest of the homes in an area. Additionally, the probability from pairing the 50th percentile monitored concentration with the design value from AERMOD results in a combined probability that is more conservative than the design value of the NAAQS. Just like the price of homes, monitored distributions are affected by very high unusual observations that “stretch” the distribution to the right. 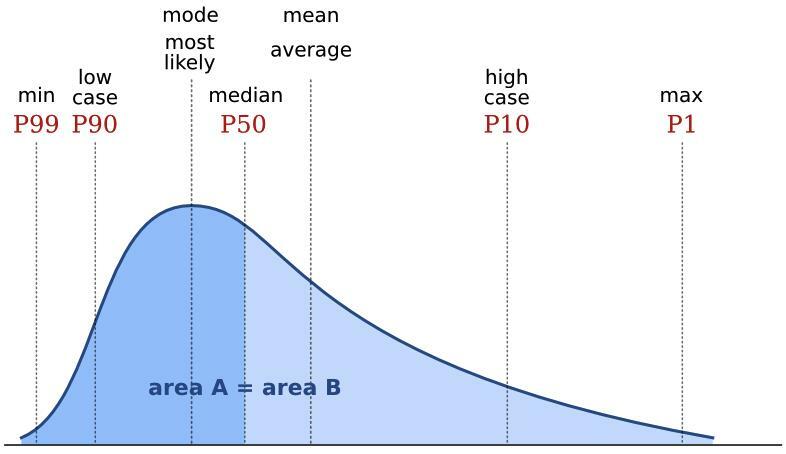 The 50th percentile (median) is actually higher than the most likely value in a positively skewed distribution as depicted in the figure above. Thus, the median is still a conservative value. Predicted and the monitored distributions are independent from each other. This independence has been proven when comparing them on a temporal and spatial basis. In other words, when comparing these on an hour by hour, and receptor by receptor basis. This temporal and spatial mismatch prompted EPA to evaluate model performance with Q-Q plots. Q-Q plots are created by comparing the ranks from the modeled and monitored values irrespective of time and space. This means that the maximum value from the monitor is compared to the maximum value from the model. The same is done for the 2rd highest values and all subsequent ranks. In this pairing exercise, the location and time of each of the ranked values will be different since these values are decoupled in time and space. In summary, the model is evaluated with Q-Q plots because of the lack of correlation between observed and modeled values. What does EPA say about Exceptional Events? The EPA defines exceptional events as unusual or naturally occurring events that can affect air quality but are not reasonably controllable. Here is the complete definition from 72 FR 13560. U.S. EPA (2007) “Treatment of Data Influenced by Exceptional Events; Final Rule” (72 FR 13560) pursuant to the 2005 amendment of CAA Section 319. (iv) Is determined by EPA through the process established in these regulations to be an exceptional event. It is important to note that natural events, which are one form of exceptional events according to this definition, may recur, sometimes frequently (e.g., western wildfires). For the purposes of this rule, EPA is defining ‘‘natural event’’ as an event in which human activity plays little or no direct causal role to the event in question. The high readings stemming from the Canadian fires qualify as exceptional events. However, the flagging of exceptional events is only performed by State agencies when there are attainment issues. Therefore, the data collected from these monitors is likely to contain observations that will overpredict background concentrations in modeling analyses. Natural events such as wildfires and volcanic activity put things in perspective since these can have significant effects on the air quality of a region. In cases such as the Canadian wildfires, air pollution from industrial activity is significantly dwarfed by the pollution from these events. Additionally, achieving compliance in cumulative modeling evaluations will be much more difficult unless the hours affected by the Canadian fires are excluded from the design value calculations. These hours should be excluded from design value calculations based on EPA’s guidance related to exceptional events. Another more reasonable way to determine background concentrations for dispersion modeling evaluations is by using the median instead of the design value since the median is less influenced by extreme events (e.g., wildfires). Furthermore, the pairing of median values with the 99th or 98th percentile value from AERMOD result in a combined probability that is more conservative than the form of the probabilistic 1-hour and 24-hour NAAQS. EPA’s Updated Guidance for Sulfur Dioxide Area Designations makes reference to two options to determine SO2 area designations in areas with large SO2 sources. These choices include dispersion modeling and ambient monitoring. Of these two options, dispersion modeling is the fastest and most cost effective one to characterize SO2 air quality. However, this compliance demonstration can be very challenging given that, in many cases, AERMOD tends to produce overly conservative concentration estimates. Facilities that meet the criteria in Round 2 (i.e., sources that either: emitted more than 16,000 tons of SO2 in 2012 or; emitted more than 2,600 tons of SO2 and had an annual emission rate of at least 0.45 lbs SO2/MMBtu in 2012; and have not been announced for retirement) should take a proactive approach and perform dispersion modeling of their facility to assess compliance with the 1-hour SO2 NAAQS. The sooner a facility starts working on their modeling analysis, the more time it will have to address and mitigate any potential issues. These changes are aimed at obtaining more representative results that can be comparable to the monitor. It is worth mentioning the difference between attainment designations modeling and attainment plan modeling. Attainment designation modeling addresses current air quality (simulating a monitor) while attainment plan modeling is used to assure attainment will occur in the future. This is the reason EPA provides to justify these four recommendations that deviate from past guidance. EBD: Facilities finding it challenging to achieve compliance through modeling should evaluate the building profile output file generated by BPIP. In many cases the building parameters generated by BPIP tend to overestimate the downwash effects in the model significantly. This is especially true for complex and elongated buildings, streamlined structures (e.g., hyperbolic cooling towers), and lattice structures. For these cases, building parameters generated with Equivalent Building Dimensions (EBD) can have a significant improvement in predicted concentrations- reductions of more than half are common. EBDs are the dimensions (height, width, length and location) that are input into AERMOD in place of BPIP dimensions to more accurately predict building wake effects. EPA considers wind tunnel EBD studies to be source characterization studies not subject to the requirements of alternative modeling (i.e., Section 3.2 from Appendix W, “Use of Alternative Models”). This advanced modeling technique is able to refine the inputs to AERMOD with the best available science. Therefore, EBD is a better and more economical option to achieve compliance while still protecting ambient air quality. Watch a video on how EBD works here. HYWINMOD: Another option available to overcome some of the overstated results from AERMOD is the use of HYWINMOD. This is a model that combines the theoretical merging of wind tunnel model predictions and AERMOD plume rise and dispersion algorithms to allow for accurate concentration estimates for any averaging time for direct comparison with health limits, odor thresholds and/or NAAQS. An evaluation against two field data bases was presented in a 2013 AWMA paper. The results show that HYWINMOD agrees as well with field observations as AERMOD, and in some case better than AERMOD. The use of this method is ideally suited for complex building or terrain configurations where AERMOD is not appropriate (i.e., urban area, very complex building configuration, upwind terrain wakes, etc.). HYWINMOD can be used to better characterize the SO2 emissions expected. Therefore, according to the December 2013 Modeling TAD, this may be a more appropriate tool that can be used to characterize SO2 designations instead of AERMOD. A critical element in the SO2 designation process is the guidance for states to carry out either of the two options for SO2 designations (i.e., modeling or monitoring). This guidance is the anticipated SO2 Data Requirements Rule (DRR). However, the Updated Guidance for Area Designations states the following about the SO2 DRR. This situation is troubling because it means that there is the possibility that EPA will have to make SO2 attainment designations without final guidance. Needless to say, this would create confusion and uncertainty for many facilities that choose either modeling or monitoring to evaluate 1-hour SO2 NAAQS. Also, even if the SO2 DRR is finalized, if it is not done promptly, it could invalidate the modeling approach followed by facilities should significant changes be included. Mike Koerber, Associate Director, EPA Office of Air Quality Planning and Standards (OAQPS) mentioned that EPA hopes to get the final DRR by fall of this year (2015). Comments made during a panel session at the A&WMA’s 108th Annual Conference & Exhibition in Raleigh, NC. Major SO2 facilities that meet the criteria in Round 2 need to be proactive and work with their state regulatory agency in the SO2 attainment designation process. There are only two opportunities rapidly approaching for the states to provide modeling information to EPA to inform SO2 designations in this 2nd Round. These dates are: September 18, 2015 and April 8, 2016. SO2 sources that are not able to model compliance with the 1-hour SO2 NAAQS will have ambient monitoring as a last resort to prove compliance. The costs of such monitoring option will be significant compared to dispersion modeling. However, before going down the ambient monitoring road, facilities should consider the use of EBD tunnel analyses and HYWINMOD. These advanced modeling methods can provide more realistic results that can avoid a costly monitoring network to prove compliance with the NAAQS. The Updated Guidance for Sulfur Dioxide Area Designations was released by EPA on March 20, 2015. The main purpose of this document is to define the schedule and process for designating areas for the 2010 primary 1-hour SO2 NAAQS. EPA issued the first round of SO2 designations in August 2013. However, three lawsuits were filed against EPA for not designating all portions of the country by the June 2013 deadline. As a result of this litigation, on March 2, 2015 EPA was ordered by the Court to complete the remaining SO2 designations for the rest of the country in three additional rounds. Have not been announced for retirement. 07/02/2016: EPA promulgates final SO2 area designations. 12/31/2017: Deadline for EPA to designate the remaining undesignated areas that do not have an SO2 monitoring network in place and operation al by January 1, 2017. This round includes areas that implement the monitoring instead of the modeling approach. EPA expects to provide guidance related to the monitoring approach in the anticipated SO2 Data Requirements Rule (DRR). You can read the proposed rule HERE. The areas that choose the monitoring approach would need to have a monitoring protocol in place by July 2016 and an installed and operating SO2 monitoring network by January 1, 2017. The areas under Round 4 would need to monitor SO2 ambient concentrations for at least 3 years (2017-2019). 12/31/2020: Deadline for EPA to designate areas using monitoring approach to characterize SO2 air quality. EPA is currently under a Court order to complete the 1-hour SO2 designation process in the time frame described above. There is still some time (but not much) to provide additional information to the state agencies to show compliance through modeling before an area is designated as non-attainment by EPA. Modeling is the preferred option due to its lower cost and effort involved compared with the monitoring approach. Facilities with modeling SO2 exceedances should try to refine their emissions and explore mitigation techniques that can produce modeling runs that show compliance with the 1-hour SO2 NAAQS. Another option for these facilities is to refine the building dimensions entered into AERMOD. This can be done with the use of wind tunnel derived Equivalent Building Dimension (EBD) which has proven very useful in overcoming the overstated downwash effects due to BPIP generated dimensions. EBDs can be most effective for complex and elongated buildings, streamlined structures (e.g., hyperbolic cooling towers), and lattice structures. In most cases, the predicted AERMOD concentrations are reduced to a reasonable level – many times to less than half of what they would be with BPIP generated building dimensions. This is the case because the building wake algorithm in AERMOD/PRIME is based on wind tunnel studies developed for specific building dimensions, but when outside of these dimensions the theory falls apart and produces unrealistically high concentrations. However, EBD can match the theory and produce more accurate results. 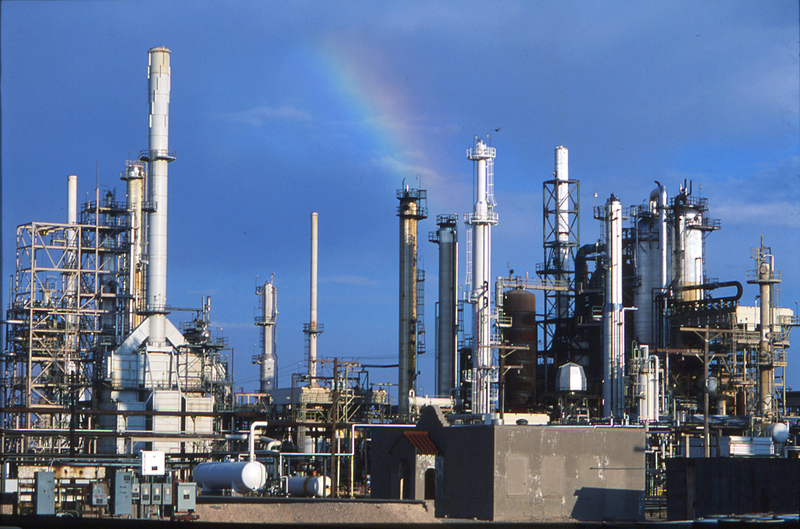 Facilities must take a proactive approach in achieving favorable dispersion modeling runs. Otherwise, the only option left is to conduct ambient monitoring which entails a greater expense and a very tight schedule related to submission of monitoring plans and deployment/operation of the monitoring network.